Converting from a terminal student information system to a web-based application is a daunting task for a school district. Couple that with the pressure to have data clean and accurate for the “money” survey in mid-October and it can seem impossible. Taylor County in Perry Florida is a model for success. Ursula Brown and her school-based staff began the journey for clean data in August 2012. Ursula met regularly with her team of data clerks to review Focus reports and to work collectively to identify data issues. Taylor was instrumental in the successful implementation of the Focus verification reports. Ursula collaborated with the Focus team to review the state edits and validations and compare them against the developed Focus verification reports. 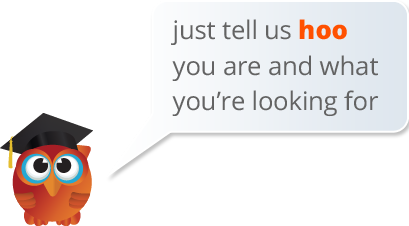 Focus provides advanced reporting that allows the user to create reports using drag-drop technology. The advanced reports allow the user to correct the data on the report screen. Focus also highlights data in error in red – flagging to the users data issues. Taylor County took advantage of the advanced reports. FTE detail and summary reports and the class size report were also used to check student data for accuracy and compliance with state regulations. The dedicated and repeated use of these Focus-provided data quality solutions allowed Taylor County to have confidence in its data as Survey 2 approached. 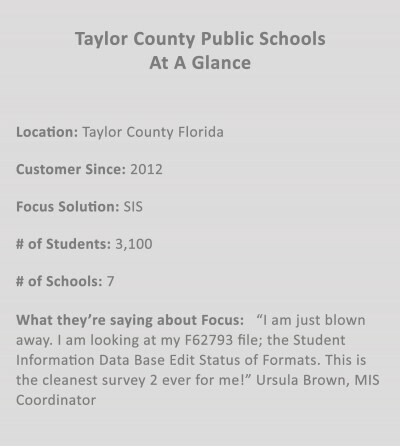 The Survey 2 processing window can be a stressful time for many Florida districts but for Taylor County the window was low-stress with high-success results.